Enjoy these holiday sugar cookies for Christmas. They're easy to make and kids will love to help you decorate them. In large mixer bowl combine sugar and butter. Beat at medium speed, scraping bowl often, until creamy (1 to 2 minutes). Add eggs, vanilla and orange peel; continue beating until well mixed (1 to 2 minutes). In medium bowl combine flour, baking powder, baking soda and salt. Reduce speed to low. Beat, adding flour mixture alternately with sour cream and scraping bowl often, until well mixed (2 to 3 minutes). Divide dough into thirds; wrap in plastic food wrap. Refrigerate until firm (at least 2 hours). Heat oven to 400°F (200°C). On lightly floured surface roll out dough, one portion at a time (keeping remaining dough refrigerated), to 1/4-inch thickness. Cut with 3-inch cookie cutters. Place 1 inch apart on baking sheets. 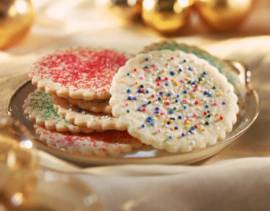 Sprinkle cookies with decorator sugars or sprinkles or bake plain. Bake for 6 to 9 minutes or until edges are lightly browned. Oh yeah! I've never had very good luck with sugar cookies, especially soft ones so these will be my new favorites. I'm freezing a bunch just to see how they do, but I don't think there will be a problem. The orange zest is just enough to give it great flavor. They puffed when cooked and stayed that way, too! Excellent. I made this as a bottom to a fruit pizza. It was delicious. If you are looking for a soft cookie, this is your recipe. Just follow these simple steps to find that you've made a scrumptious dessert that most people will enjoy. I was specifically searching for a sugar cookie recipe with grated orange peel in it and came across this one. I love sugar cookies with orange peel. Anyway, these cookies are fabulous! They are fluffy and soft and beautiful! We cut out hearts and lips with them for Valentine's Day and they look great. My kids loved them even with out frosting which never is the case! Thanks for sharing this great recipe! This is my new favorite sugar cookie recipe! My mom used to use a recipe with orange peel and I always loved them. I use almond extract instead of vanilla and also use almond extract in the powdered sugar icing. They taste like Cookies By Design (or as close as I can get). They are nice, thick, soft sugar cookies. Love this recipe, the only one I use now! They were AMAZING! I loved them! Looks great, but um...what is orange grate peel? Absolutely the best sugar cookies I've ever made. My two girls LOVE them! They are soft, keep their shape when cut-out and taste great with or without icing! I make them every year for my kids Christmas parties and school and everyone loves them! I get lots of requests for the recipe! Thank you!! Delicious! It's almost impossible to burn them.